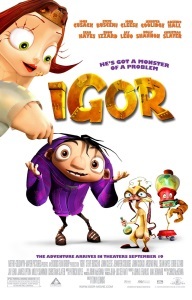 In style and tone, "Igor" seems more like a short from the adult-oriented "Spike & Mike's Festival of Animation," or the Mike Judge-produced "The Animation Show." The computer-animated visuals look drab when compared with recent Pixar and DreamWorks offerings, and the character design leans more toward disturbing than cute. Put the inhabitants of this film on a fast-food restaurant kids' meal, and everyone will lose their appetite. But the writing by "American Dad" contributor Chris McKenna is sharp, making fun of the monster films of the black-and-white era while weaving in current popular culture targets as well. When one of the characters is assigned an evil brainwashing, she's locked in a room and forced to watch "Inside the Actors Studio" interviewer James Lipton - and walks out demanding a bigger trailer. Scamper the rabbit and Brain the brain-in-a-jar (voiced by Steve Buscemi and Sean Hayes) have about three times as many good lines as the typical animated-film comic relief. While the overall review is mixed, the film does deserve one big compliment: The music is excellent, featuring everything from retro swing to classic rhythm and blues. This is the only animated film you'll see all year with "Baby Won't You Please Come Home" on the soundtrack.